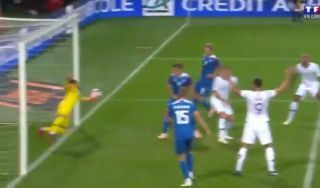 Tottenham goalkeeper Hugo Lloris may not be having the best season for his club, but watch the video clip below of a truly stunning triple save for the French national team tonight. The Spurs shot-stopper shows lightning reflexes to keep out three efforts from Iceland players from close range and keep the score at just 1-0 at the break. This follows Lloris’ awful error in Spurs’ recent defeat to Barcelona, as well as a drink-driving charge, as reported by the Guardian.